While mobile terminal devices are being diversified, people’s daily life is becoming more convenient and enriched, like smart phone, tablet computer, Internet television, Internet of things and so on. As mobile devices are widely used, a higher demand on coverage area, function and performance of wireless network is put forward. Wireless network is widely applied in various scenarios like home wireless network, hotel wireless network coverage, enterprise wireless network, public wireless network, wireless monitor network, wireless relay and so on. Wireless network is not only the extension and supplement of wired network, its future trend will be the integration of wireless and wired. On the situation of more and more wireless access terminals, access frequency becoming higher and access time becoming longer, wireless network is facing difficulties like small coverage area, unstability, low bandwidth, blind spot and so on, many users choose WIFI terminal devices with high power and bandwidth to build network. WLAN technology starts from the middle of 1980s, IEEE 802.11 workgroup is responsible in constituting technical standards. So far, the workgroup has successively released many standards like 802.11a/b/g/i/e/n/k, which makes a gradual perfection on the aspect of user bandwidth, wireless security and manageability. According to the latest standard 802.11ac, frequency band of 5GHz is used, wider base band, more MIMO and modem with high-density are applied. Theoretically, 11ac can provide bandwidth of 1Gbit for multiple site services, or provide transmission bandwidth of 500Mbit for single connection. AP that supports 802.11ac has become the first choice of WLAN construction. The network subject of this solution applies local area network networking mode, the end-point applies AP wireless coverage. 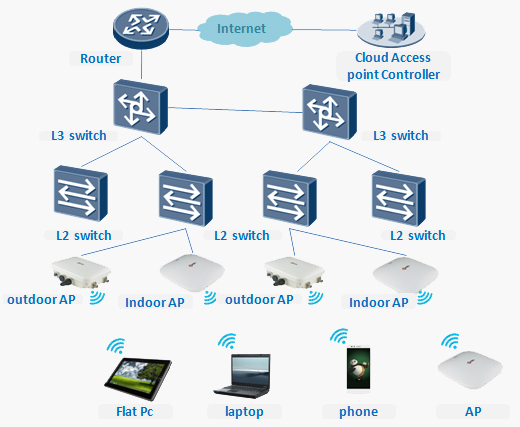 Related product in this solution includes router, core switch, access switch, wireless AP and so on. The switched network of upper layer router of AP device applies existing mature local area network constructing mode: router + switch. In AP access layer by connecting AP to the Ethernet port of existing network to transform wired signal into wireless signal, then accomplish the communication with wireless terminal devices. Wireless AP is designed in outdoor and smart type with characteristic s of manageability, large coverage, high performance and high bandwidth, which meets end-user’s requirements. Systematic wireless product of C-Data has two kinds including indoor and outdoor type, which can meet user’s requirements for different environment in wireless networking. The product of outdoor type is a high-power wireless AP device, it adopts enhanced radio frequency emission technology, output power of radio frequency reaches high level in full rate, by cooperating with built-in high gain directional antenna, wireless transmission distance and throughput of AP are improved greatly which makes it more applicable for long-distance transmission of wireless data. The product follows standard of 802.11a/b/g/n and 802.11ac protocol, with the design of waterproof, dustproof, ultraviolet-proof, internal and external antenna switchable, structure of cast aluminum + integration antenna, all-weather applied themal design that supports a wide temperature application environment from -40 to 65 celsius degrees, and supports POE power supply and the convenient and efficient design of pole mount, which reduces the complexity of installment and maintenance to the minimum. The product of indoor type is a high-power ceiling mounted AP with double frequency. This AP product adopts optimized radio frequency emission technology, provides broader coverage area and higher signal quality, meets the standards of 802.11b/g/n and 802.11ac protocol, supports installment of ceiling mounted, wall mounted and keel installation, has the design of environment protecting and energy conservation and supports 48V POE power supply, when providing high emission power, the overall power consumption is still low. There is smart antenna inside, which effectively solved coverage problem of dead angle in a room.